address below or to your Roche representative. notice as part of ongoing product development. LIGHTCYCLER, LC, MAGNA PURE and HIGH PURE are trademarks of Roche. Melting experiment in the presence of LightCycler® 480 High Resolution Melting Dye. 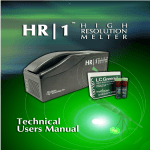 combination with the LightCycler® 480 Instrument and LightCycler® 480 Software. Technology Inc., Salt Lake City, UT, USA. Diagnostics GmbH and/or licensed from Idaho Technology, Inc.
covered by US 5,871,908 or any foreign equivalents. a copy of the receipt against refunding of the purchase price for this Software. Supplier grants to Licensee subject to continuous compliance with all the provisions hereinafter, a non-exclusive, single-use license to use the Software upon the terms and conditions contained in this Agreement. this Agreement. In addition, Licensee must ensure that the copyright notice is maintained on the Software transferred. a. Use the Software, in whole or in part, except as expressly provided in this Agreement. b. Use the Software on more than five workstations at a time. in whole or in part, to another party, except as expressly provided in this Agreement. d. Rent, distribute, license or sublicense the Software. e. Create derivative works based on Software. f. Modify, adapt, translate, reverse engineer, decompile or disassemble the Software. OF PERFORMANCE, A COURSE OF DEALING, TRADE USAGE, OR OTHERWISE. TO BE ATTAINED BY LICENSEE OR ANY THIRD PARTY FROM THE SOFTWARE. LICENSEE ACKNOWLEDGES THAT IT HAS NOT RELIED UPON ANY REPRESENTATIONS OR WARRANTIES MADE BY SUPPLIER OR A SUPPLIER’S AFFILIATE EXCEPT FOR THOSE EXPRESSLY AND SPECIFICALLY SET FORTH IN THIS AGREEMENT. LICENSEE WITH RESPECT TO THE SOFTWARE. assign or transfer any of the rights, duties or obligations hereunder is void. not authorized under this Agreement. destroy the Software upon termination of this Agreement by Supplier. On any termination of this Agreement, all rights of use of the Software held by Licensee shall expire. Licensee shall be exclusively responsible for ensuring compliance with the relevant legislation relating to its rights to import, export or use the Software. Should any part of this Agreement be declared void or unenforceable by a court of competent jurisdiction, the remaining terms shall remain in full force and effect. reference only and are not intended to be a part of or to affect the meaning or interpretation of this Agreement. Goods (1980) is specifically excluded from application to this Agreement. Steps in a procedure that you must perform in the order listed. Points to a software function or element. Information critical to the success of the procedure or use of the product. Procedure continued on next page. an appropriate firewall and has not been designed for such use, Roche assumes no liability in that regard. Anti-virus software is not provided. Therefore, it is essential to take precautions to ensure that any software loaded onto the system is virus free. (called homoduplexes) and mismatched hybrids (heteroduplexes). LightCycler® 480 Instrument; post-PCR analysis does not require a separate device. amplification reaction (PCR) before the High Resolution Melt. Both procedures are performed in the presence of a fluorescent dye that binds only dsDNA. The dye does not interact with ssDNA, but fluoresces strongly in the presence of dsDNA. This change in fluorescence can be used both to measure the increase in DNA concentration during PCR and then to directly measure thermally-induced DNA dissociation during High Resolution Melting. strands at a lower temperature and with a different curve shape than homozygote DNA. strands. The observed “melting” behavior is characteristic of a particular DNA sample. even more dramatically in shape from “wild type” curves. curve is actually a composite of both heteroduplex and homoduplex components. LightCycler® 480 System Gene Scanning experiment. High Resolution Melting analysis relies on a new generation of dsDNA binding dyes. dyes traditionally used in real-time PCR (e.g., SYBR Green I or ethidium bromide). LightCycler® 480 High Resolution Melting Dye is not toxic to amplification enzymes. completely saturate the dsDNA in the sample. changes in High Resolution Melting Dye fluorescence. the dyes no longer show a preference for products that melt at higher temperatures. resolution of the recorded melt profiles. Carl T. Wittwer, Gudrun H. Reed, Cameron N. Gundry, Joshua G. Vandersteen, and Robert J. Pryor (2003). variations in the PCR product. used. LightCycler® 480 Gene Scanning Software has been developed specifically to provide the most accurate analysis of High Resolution Melting curves. identify the negative samples in the run manually. by the different shapes of their melting curves. that have similar melting curves (e.g., those with the same genotype). appear as positive melting curves in the example shown. amplicon), resulting in 3 main variant groups. literature and 3 samples of a further genetic variant. DNA melting profiles. These profiles are then compared from sample to sample to determine relationships between the samples. thermal control system to generate highly reproducible results from sample to sample. many samples in a single run. ►► Any amplicon can be screened for unknown sequence variants with a single highresolution dye; you do not need to target a specific variant with allele-specific probes. ►► You can design a genotyping assay on the basis of less sequence data. ►► Each reaction generally reveals more information. SSCP) which require amplicons to be screened for sequence variants on a separate instrument after PCR. neous techniques. Variants can be detected regardless of their position within the fragment. scanning methods are unable to distinguish these alterations from wild type sequences. several different types of amplicons. relatively short sequence (100 - 250 bp). Primers should anneal at temperatures around 60°C. amplicon with software that can profile secondary structures. be used for the reaction (e.g., 60°C). tion reaction. For best results, the delta-G values should be above -1. Because a LightCycler® 480 System Gene Scanning experiment involves comparing melting profiles from independent PCR reactions, it is crucial to minimize reaction-to-reaction variability. Standardizing the template DNA is one means of minimizing variability. and other salts in the reaction mix are as uniform as possible for all samples. degradation) typically produce variable High Resolution Melting results due to amplification artifacts. gas), which frequently occurs in such samples and concentrates salts and other material that affect both amplification and High Resolution Melting. short amplicons (100–250 bp). Use a software package like Primer3 (see http://frodo. 2.0 for designing the primers. Use primers that have been purified by HPLC. than 300 nM) in the experimental reactions. production of specific product is weak, try higher concentrations of the primers. no MgCl2. The Master is compatible with additives (e.g., DMSO) that enhance amplification of GC-rich sequences. is active only at high temperatures, where primers do not bind non-specifically. The enzyme is completely activated (by removal of blocking groups) during a single pre-incubation step (95°C, 5 minutes) before cycling begins. assay. Determine the specificity of each PCR by agarose gel electrophoresis. The amount of MgCl2 in a reaction will affect the shape and Tm of the melting profile. a fragment will melt with a slightly higher overall Tm. contribute to the overall fluorescence and melting profile. Calculate the exact elongation time required for your specific target by dividing the amplicon length by 25 (e.g., a 500 bp amplicon requires 20 s elongation time). This pre-hold temperature ensures that all PCR products have re-associated and encourages heteroduplex formation. starts at least 10°C before and ends at least 10°C after the expected Tm value. No special analysis mode for Gene Scanning assays is available. Gene Scanning experiments are performed in standard Melting Curves analysis mode. Module of the LightCycler® 480 Software). That plot should show no peaks for the notemplate control. If initial experiments show reaction product in your no-template control, reoptimize the reaction (e.g., by designing new primers) and repeat the experiment. Software module. There is no need to run a separate Tm Calling Analysis. non-Roche PC follow the steps below. the LightCycler® 480 Software must be installed on the PC. Make sure that you have the administration rights to install the software. Insert the LightCycler® 480 Gene Scanning Software CD. If installation does not start automatically, double-click ScanningModuleInstall.exe. wizard. The InstallShield Wizard window opens. You are prompted to agree to the license conditions. Click Yes. The LightCycler® 480 Gene Scanning Software is installed. When the installation process has finished, the InstallShield Wizard Complete window is displayed. and subjected to a melting curve experiment, the software analyzes the shapes of the individual curves and groups samples that have similar melting curves. experiment. In this case, the software compares the melting curves of the individual samples to the designated in-run melting standards. If you wish, you may also include control samples (e.g., negative controls or no-template controls) in your experiment. Internal standards act as positive controls. Define the properties of the samples. Operator’s Manual, section “Entering Sample Information”. Click Analysis in the Module bar. In the Create New Analysis list, select Gene Scanning. The Gene Scanning Analysis screen opens. default after it creates the analysis. Unknown or the Negative group. with sequential numbers (1, 2, etc.). Some groups may contain no samples. the Variants group, the Unknown group or the Negative group. No further grouping will be done. remove them from the analysis (i.e., deselect them). negative samples to the Negatives group (see below). Click the Normalization tab to normalize the melting curves. Fluorescence values acquired during High Resolution Melting will vary in magnitude, e.g., due to differences in the starting amount of template in each sample. sliders indicates the area used for normalization. is used to set the Post-melt Temperature Range. and that the Post-melt Temperature Range is placed in an area where melting is complete for all samples. Threshold, which can also be used to set the Temperature Shift level. Temperature Shift either by entering a value in the Threshold control field or by dragging the horizontal slider on the upper graph. default level of 5 produces acceptable results. Now click the Calculate button to analyze the results and determine the grouping. to each group. Simultaneously, the software calculates the Normalized and Temperature Shifted Difference Plot. genotype groups (if you selected the Comn/Vars analysis mode). ►► Negative and Unknown groups. ►► Group: Name of the genotype group to which this sample is assigned. ►► First the software selects the group that contains the most samples. genotype. The difference between the reference and each remaining curve is plotted against Temperature. standards in the chart. These appear as black lines. is defined as the standard for that group. Click Select base curve to manually define the reference curve for the Difference Plot. By default, the standard of the largest variant/genotype is used as base curve. chart’s options toolbar is displayed, containing a chart menu. To change the chart type, select the new chart type from the respective Chart menu. Melting Curves chart in the Temperature Shift tab. The normalized and shifted melting curves are basis for calculating the Difference Plot. function lets you influence the stringency with which melting curves are classified into different groups. A high Sensitivity value generally produces more groups than a low value. in ­version 1.5 with the same sensitivity value. On the Groups tab in the Results table, you can change the name associated with each variant/genotype group. group boxes that are displayed. Sample Selector and the Results table. change the assigned group by using the New Call option. affected samples currently displayed in the graphs to the new name. standards and controls. If you choose not to continue, the operation will be cancelled. ►► If the current experiment does not contain a subset with the same name, the software creates the subset. you are able to apply the template. ►► If every Negative Control is designated negative, the run passes this control check. ►► If any Negative Control is not designated negative, the run fails this control check. which controls have failed this check. ►► If every internal standard is designated positive, the run passes this control check. the run fails this control check. run fails this control check. ►► If any internal standard is designated negative the run fails this control check. the Gene Scanning analysis and the analysis-specific Sample Editor will be set to readonly. LightCycler® 480 Gene Scanning Software is not installed. the report will contain the read-only information from the Gene Scanning analysis.